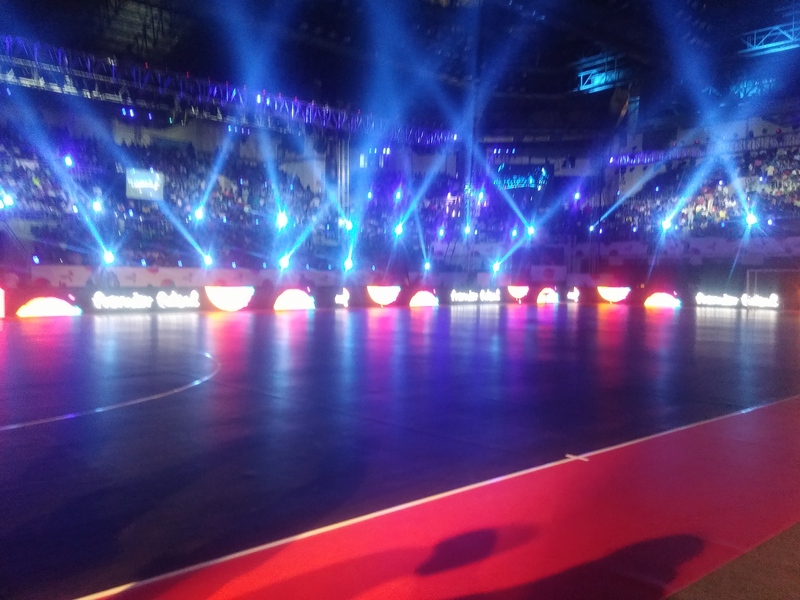 This summer I was in India for the first edition of Premier Futsal, a new league that featured some of the world’s top players. It received a lot of attention and was seen across the world. I was the Technical Commissioner for the event and in this post I’ll give an insight into my experience from behind the scenes. I first became aware of Premier Futsal at the start of last season when I was contacted and agreed to play in the tournament. In the run up I provided some advice informally to the organisers on futsal matters and I arrived in India before the other players to provide some guidance for the final preparations. On arrival in Mumbai I went straight into a meeting with the main figures in the organisation. On the way we passed many bilboards promoting the event. In the meeting there were people from the TV broadcasters, strategy consultants and venue operations, all of which had experience with world class sporting events but not with futsal. It was great to be involved in these discussions and to have an influence on how the competition would be run and presented. After a few days of meetings, the management decided they required someone with futsal experience working full-time in the organisation and offered me the role of Technical Commissioner. Due to the potential for conflicts of interest, accepting this position would mean not being able to play. As much as I love playing, the offer to be part of the senior management team on an event that would bring futsal to 1.3 billion people for the first time, and have an impact in increasing the awareness of the sport was a unique opportunity. Further, it would be a great experience that could provide useful for my career after playing. It was difficult decision but I had to accept the offer. The role of Technical Commissioner could be summarised as being accountable for everything related to what occurs on the field of play but in practice it extended much further. Some of my key responsibilities included the rules, competition structure, match protocols and speaking with the media. I also selected all the individual awards, such as Man of the Match and the MVP, throughout the competition. For those of you who didn’t follow it closely, here is a quick summary of the tournament. It featured six teams from different cities in two groups of three with a knockout phase of a semi-final and final. All the games were played in two locations, Chennai and Goa. Each team consisted of 1 legend player, 1 freestyler, 5 futsal players and 5 Launchpad players. Five of the legend players were ex-football players which included Ronaldinho and Ryan Giggs. When they told me of the intention to have these famous footballers playing I was not keen on it as I was worried it could make futsal seem like an exhibition sport. However, I understood when it was explained to me with the sport being new in India it would not gain attention without them. They were proved right and it was a marketing investment that gave an excellent return. It created an incredible amount of attention both in India and abroad, intially for the legends but then for the futsal on show. The legends certainly didn’t take it as an exhitbition and were all very determined to win with the action on court being at a high standard. They all did very well but Ronaldinho’s five goal performance was one of the most incredible things I have seen and it went viral all over social media. The role of the legends is something that will be evaluted in the future as the awareness of futsal increases. The other legend was Brazil’s Falcao which I liked as it showed respect for futsal by putting a star of our sport and his achievements on the same footing with the other legends, who are widely recognised as some of the most successful and important athletes globally. Each team featured one freestyler. I would have prefered that they only be used for half time shows rather than as part of the playing squads. Futsal, due to the way it is often promoted, has too close an association with freestyle football. It can create a false perception that it is all about tricks rather than its principal outstanding quality of constant high speed action. Freestylers are amazingly talented with unbelievable skills but I think to sustain an audience long-term there needs to be an intense competitive feel to a sport rather than a display of tricks. In the end, due to their level of futsal not being near the professional futsal players, the coaches barely played them. The Launchpad players were Indian players who had been selected from a nationwide talent search and there was a rule that a minimum of one Launchpad player must be on court at all times. The organisers wanted an Indian presence which was a great decision and really added to the tournament. The Launchpad was for any male players between 18-24 years old and events were held in every state in India. I created some futsal specific tests that were carried out in the initial selection process. This whittled down the numbers from thousands of applicants to around one hundred and twenty. This group travelled to Chennai where the final 36 successful entrants were selected. Alongside a representative from the Indian federation we selected those that would enter the draft after assessing them over 3 days of matches. It was a very difficult task in terms of both trying to identify the best as well as being aware that you were making decisions that would end people’s dreams. It was great to see the Launchpad stars take the opportunity to make an impact and they scored many goals. One, Jonathan Piers, was so dangerous that Mumbai had to assign Barcelona defender Gabriel to man mark him. Many had interesting background stories with guys for whom professional football hadn’t worked out and others coming from poverty. One of the most amazing things during my time in India was speaking to them and seeing the smiles on their faces when they talked about the experience of sharing the court with world class futsal players and legends, all in front of a worldwide audience. They couldn’t comprehend what had happened to them. Several told me they had fallen in love with futsal and would now commit to it. I think the legacy in India of the first Premier Futsal season goes further than just the Launchpad finalists as seeing high level futsal and the Indian players will have inspired many children to take up the sport around the country. Plus the whole of India now knows what futsal is. The hope is it this will create a futsal following in the country to ignite the sport’s development there, which didn’t exist beforehand. A few of the standard futsal rules were changed for the competition. The fundamentals of futsal and what make it spectacular were present such as 5v5, played indoors, regulation goals, court dimensions and type of ball. The adaptions of peripheral rules were for reasons including introducing the game to a new audience, federation requirements, TV schedules and a desire to innovate. For the 2nd season the rule changes will be evaluated and, as the viewers become more familiar with the game, there will be a transition to more of the standard rules. I will explain the three main rules that were altered. Games were played to four quarters of 10 minutes of running clock for TV schedules which were very tight. In practice the quarters worked really well. Futsal is such an intense and engaging game that it can be quite mentally draining for an audience (and players!). I think the quarters create a nice pattern to the game with high tension followed by a short period of calm. I have said previously how sport must engage an audience the same way a story does in other forms of entertainment. No good film or TV show is high drama continually for whole duration. In the future it will be looked to introduce stop clock which I personally would prefer. Throw-ins rather than kick-ins were used when the ball went out on the sidelines to have one rule fewer to explain as people understand it from football. India is a country which is obsessed with cricket and futsal had no presence. Football is known widely even if only followed by a passionate minority. To be introduced it had to pass the test of not negatively affecting the spectacle. I researched and produced an analysis on the differences between the two by watching games from Spain where throw-ins were used until 2006. My conclusions were that throw-ins got the ball in play quicker (don’t have to place ball down, wait for opponents to be 5m distance and ball doesn’t get blocked to go out of play again), created more goal scoring opportunities and led to more spectacular goals such as volleys. I know the opinion on throw-ins in futsal is very divisive, with some strongly for and others strongly opposed. I would add that throw-ins are the original rule in futsal before FIFA created their variation. In countries such as Brazil and Spain where futsal was popular before FIFA was involved there are many people who want the throw-in to be reintroduced, as they believe it has had negative impact on the game. Ties in the knockout stages were decided by a penalty shootout where penalties were taken from the second penalty mark with 5 seconds to score. This was decided as more interesting way to conclude a game where two teams could be separated during open play. When bringing in innovations such as this we must be careful and maintain the essence of the sport but should not be afraid to amend regulations that enhance the spectacle. We have to allow the game to move with the times. If you take away the drama of whether a goal will be scored or not, a 6m penalty is not great to watch or involves much skill. It lasts milliseconds as a player generally smashes it with the goalkeeper left with no time to react. The penalty shootout is much more interesting. There is strategic decisions to be made by the player, do they shoot immediately or dribble? Same for the goalkeeper. Do they stay on the line or do they come forward? It is also has the potential to help promote the game by creating clips that go viral on social media, a key platform for marketing in today’s world. The final was decided in this way and it was very enjoyable to watch. I think this it will only improve as players become more familiar with it. In addition to my position as Technical Commissioner I was appointed as a TV commentator and analyst for the tournament. I have always enjoyed doing commentary with Eurosport and was happy to do it again plus being live on screen would be a new challenge. The organisers had hired a top level team that worked behind the scenes to ensure the broadcast of futsal was at the highest level possible. They had highly experienced people from India, Portugal, The UK and South Africa who had worked on global sporting events such as the UEFA Euros and IPL cricket league, and produced films such as Senna and Cristiano Ronaldo. The way the tournament looked on TV was very impressive and like nothing seen before in futsal. There were several factors that contributed to this. They made the venues look amazing, including how the lighting presenting the game like the centrepiece of a show. To get the best shots there were 16 cameras in total, compared to 6 at the 2016 UEFA Futsal EURO. One camera was a new piece of technology that had the capability to zoom in on slow motion replays without a loss of quality, a first for sport worldwide. They also experimented with innovative camera positions and shots which all enhanced the viewing experience. It has created a precedent for the TV production of futsal and I hope other futsal competitions will have taken notice. It was shown on the main sports channel in India. The audience figures were very positive, with over 3 times the unique viewers and average audience than the 2nd season of the ISL in 2015, India’s main football competition. It also got over 40% female audience on the first day, a group in India that don’t usually watch sport showing futsal is sport to be enjoyed by everyone. The rights were bought by several international broadcasters. This included BT Sport from England who also show Premier League and Champions League football. It was one of BT’s best performing programmes and they repeated it throughout the day. In England we have tried for many years to get one of the main sport channels to show futsal and it I never contemplated that it would be a competition in India that would achieve this first. 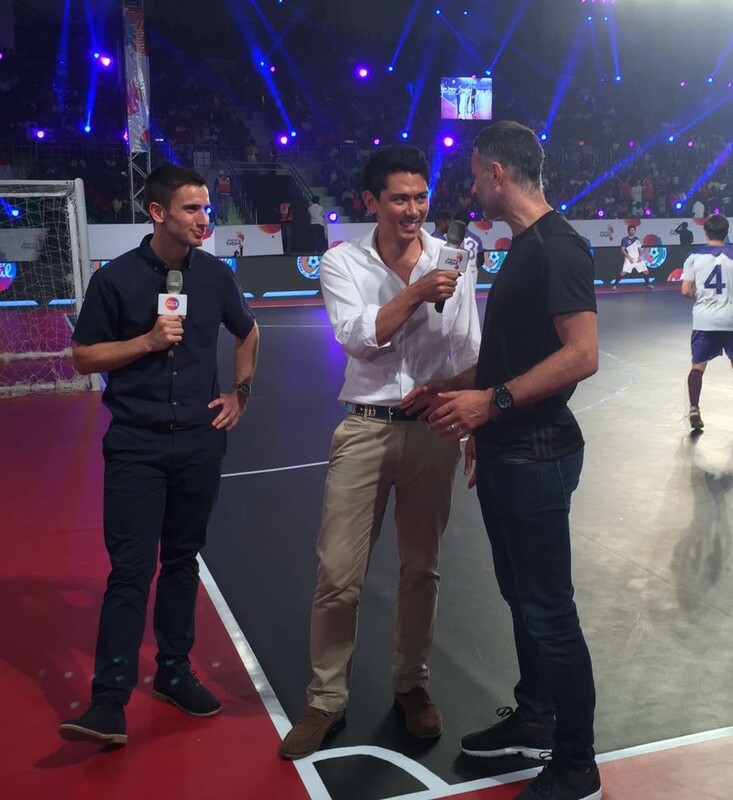 It has sparked BT Sport’s interest in the sport which is positive for futsal in England. Live futsal was accessible across the world for free through Facebook Live Streaming, the first league in the world to do this. The cumulative viewing figures reached over 1 million. For those that didn’t catch the games live, the highlights were all over social media platforms amd reached many people who had never seen the game before. Premier Futsal broke new ground and took futsal to another level. 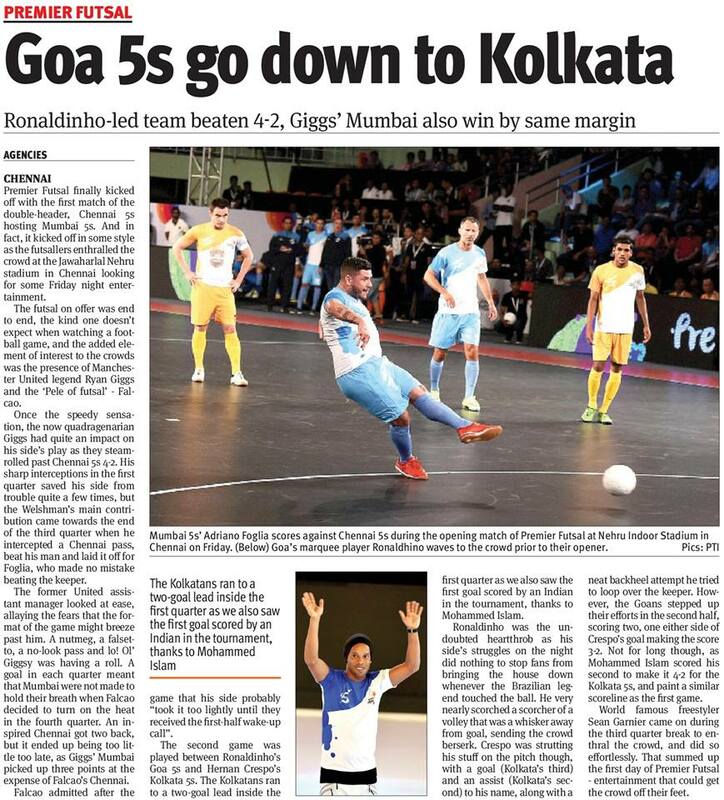 One reason for this was that the people involved weren’t ingrained by how futsal had conventionally been presented and, the fact it was the first time futsal had been seen in India, they had more freedom to be creative. I think in Europe we are sometimes hampered by tradition as our sports market has been established and successful for such a long time. If you look at the production of football it hasn’t really changed much, apart from the introduction of colour, from when it debuted on TV over 50 years ago. Futsal is an incredible sport but that doesn’t mean we should be complacent. We need to give it the best chance to succeed and present it in the best way possible as it faces intense competition from all the alternative choices people have to spend their time. The innovation wasn’t restricted to the TV Production and there were lots of interesting ideas put forward during the pre-tournament discussions. Some of them I had to let sink in as being heavily accustomed to traditions would often mean my initial reaction would be to dismiss them without giving them real consideration. One idea that was implemented was having a special armband for the leading goalscorer. Obviously, traditionally only the captain wears an armband. But what really is the need for that? Throughout the tournament the player with the most goals wore a golden armband and no captains wore them. I think identifying the leading goalscorer was of beneficial value to the audience. Another idea was to start the game with a ball dropped from a drone which I thought was a gimmick but after consideration came to the view it was a more exciting way to start a game. However, for safety reasons it didn’t go any further. Going forward, Premier Futsal will continue with a desire to innovate and we have already formulated some ideas for the 2nd edition. Every proposal will be carefully considered and evaluated to identify what is a gimmick that doesn’t bring value and what is unnecessarily constrained by tradition. Some ideas will be rejected, some trialled and discontinued but those that will enhance the sport of futsal will be implemented. Involving the top people in their fields worldwide, making futsal look as spectacular as it did and promoting a futsal event requires substantial investment as all these things are costly. This is what Premier Futsal, a commercial venture that has an objective to be profitable, were prepared to do. To find this level of investment for futsal projects there has to be a potential for a return. Futsal is a sport that has been undervalued and has suffered from a history of underinvestment that has hampered its development. Despite this, some still view substantial investments with an aim to make a profit as not beneficial to the sport’s progression. In actual fact generating income is essential for any project to have a long-term future. If you are losing money because you are spending more than you are earning then it will not be sustainable and will only have a short-term impact. Unfortunately, this has been common in futsal and we have seen this with successful futsal clubs around the world who have a period of success before imploding. I have experienced this first-hand. Some may argue that investment is fine but should go to the grassroots. That sounds great but to develop a sport, requires not only building from the bottom and you need to invest at both the grassroots and elite level. The elite creates the awareness of the sport and draws in interest as we see currently with The Olympics. 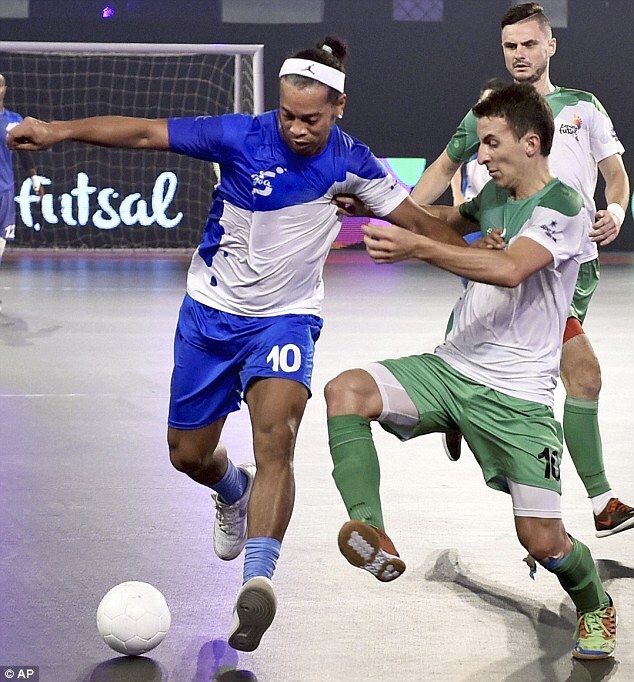 The action from Premier Futsal that beamed across the globe was a wonderful advert for futsal and millions of people took notice of it, many who had never heard of the game before. Having an elite level also gives a pathway for young players that is needed for them to be committed and motivated. If we want the game to grow and get the exposure it deserves then it will require investment at all levels. It would be great if federations recognised futsal’s potential and were making these investments in elite futsal but, if they are not, then private investment will step in to provide the desperately needed funds. On a personal level, to feel I played a part in an event that took futsal worldwide, was very rewarding. I didn’t have much time to take in its impact immediately as I went directly from India to Orlando, USA for the World Futsal Championships and PFL All-Star Showcase. It was great to fill my summer with these major futsal events, in two hugely important countries. I am really looking forward to seeing how futsal develops over the next few years and I hope I’ll be able to contribute to that. 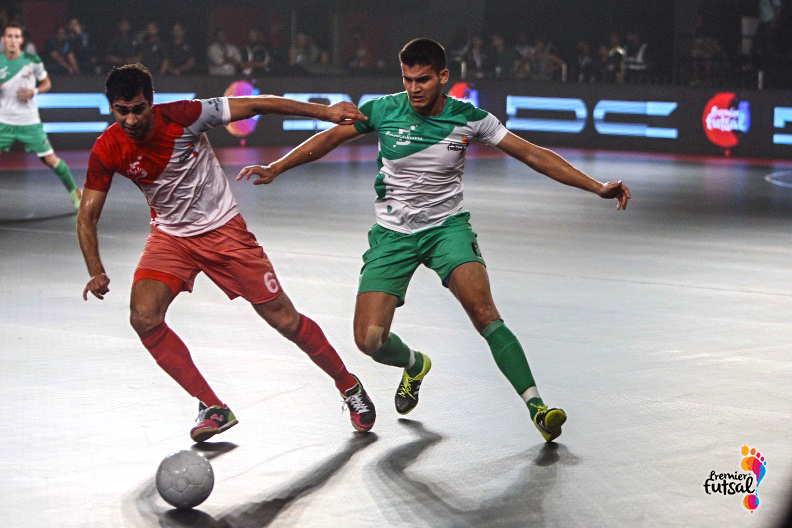 Futsal is showing signs of a juggernaut that can’t be stopped. Premier Futsal’s first season was considered a huge success from various perspectives. It caused a big reaction that went much further than just the traditional futsal community and was covered in important news websites all over the world. The buzz created around the sport has led to many new futsal fans and participants. It demonstrated the potential futsal has and that it just needs a suitable platform that will give it exposure. A lot of credit has to go to the people behind Premier Futsal as they had an ambitious vision and the courage and ability to pull it off. Premier Futsal is not a one-off event and there is an ambitious long-term plan behind it. The day after the final we had a debrief meeting where the things that went well and those that can be improved were identified. I am sure it will be even bigger and better in the future and I am really interested to see where it goes. I hope for the development of futsal, it will be successful. Look out for season 2!